Originally published under the title "Do we worship the same God? Wheaton College, Larycia Hawkins and Miroslav Volf." Those who claim that Muslims and Christians do not worship the same God base this upon Muslims' denial of the Trinity and the incarnation. Jews deny the Trinity and the incarnation, yet Christians down the ages have not claimed that Jews worship a different God. Therefore, those who do not accept the "same God" thesis must be motivated by enmity, not reason. There are problems with this reasoning. One is the premise. Wheaton had not itself stated that it objects to the "same God" thesis on the basis of Muslims' beliefs about the Trinity and the incarnation. However Volf appears to impute this thinking to all Christians who do not accept his "same God" thesis. The Qur'an projects an understanding of God very different from that of the Bible. In reality the best and strongest reason for rejecting the "same God" thesis is not Muslims' disbelief in the Trinity or the incarnation. It is that the Qur'an projects a different understanding of God from the Bible. As Denny Burk of the Southern Baptist Theological Seminary in Louisville put it, "our books are very different." Eminent Orthodox Jewish theologian Michael Wyschogrod observed that the Christian doctrine of the incarnation was grounded upon the fundamentally Biblical – and thoroughly Jewish – concept of the indwelling of God's Shekinah presence with his people. Christian beliefs about the Trinity and the incarnation developed out of Jewish incarnational theologies. Unlike the Old Testament, the Qur'an completely lacks a theology of the presence of God. Although the Arabic term sakīnah – borrowed from Hebrew shekinah – appears six times in the Qur'an, it has been repurposed to mean 'tranquility', and the concept of the personal presence of God is not comprehended by Quranic theology. It is not just that Islam rejects the incarnation of Jesus: in complete contrast to Judaism its scripture offers no basis for an incarnational theology. Christians and Jews share scripture. Islam rejects the authority of the Bible. First, Christians and Jews share scripture. Judaism bases its understanding of God on what was the Bible of Jesus, the Tanakh or Old Testament. This is not the case with Islam. Muslims do not base their theology on any part of the Bible. Indeed mainstream Islam rejects the authority of the Bible, for reasons clearly stated in the Qur'an. Second, Jesus was a practicing Jew, and so were his disciples, so it would be absurd to state that the God of the faith Jesus practiced is different from the Christian God. This same observation does not apply to Islam. 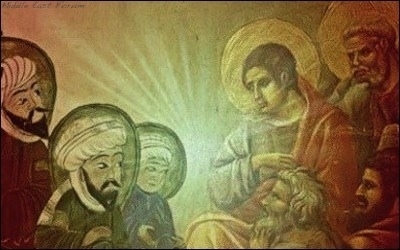 Muhammad was never a practicing Jew or a practicing Christian, and, according to Muslim tradition, the large majority of his companions came to Islam out of paganism. This has deeply influenced the Qur'an and its understanding of God. It is disappointing that Volf attributes fear-based enmity and loveless bigotry to Wheaton's leaders. He implies that Christians who disagree with his "same God" thesis must want to fight Muslims. Such rhetoric incites hatred and contempt over a theological difference of opinion. It is unhelpful to politicize theological inquiry by demanding assent to the 'same God' thesis. The question of whether the God of the Qur'an is the same as the God of the Bible is an important and complex one. Christians do need to consider carefully to what extent the God of the Bible and the God of the Qur'an are the same or different. This has far-reaching implications. However it is not helpful to paint those who disagree with one position or another as haters. It is a false step, in the name of love, to demand assent to the "same God" thesis. Christians are commanded to love others whether they worship the same God or not. Our common human condition should be enough to motivate solidarity with others. After all, Jesus never said to only "love those who believe in the same God."